Commemorating a Century of Hope for Children and Families! In the early part of the 20th century, these were the names for the homeless, abandoned and troubled youth of America. In many eyes, reform schools were seen as their only destination, where vicious cycles of cruel treatment and rebellious behavior would send children deeper into delinquency. It took the vision of one man and his heartfelt belief that "there are no bad boys . . . only bad environment, bad training, bad example, bad thinking" to break patterns built over generations. With $90, Father Flanagan opened his Home for Boys in downtown Omaha, Nebraska in 1917. Accepting boys of all races and creeds, Father Flanagan's work would expand, moving to Overlook Farm in 1921. This parcel of land would grow into a sprawling village, today known as Boys Town. ". . . the work will continue . . . whether I am there or not, because it is God's work, not mine." A century later, the loving work begun by Father Flanagan has grown into one of the largest youth organizations in the world with 12 Boys Town sites across the country. The lives of tens of thousands of boys and girls have been redirected and enriched by Boys Town's residential programs. In addition, over two million children are reached every year through the charity's family services, educational resources and medical research -- in person, over the phone and online. It's a culture of selflessness and understanding, all built on a cornerstone of faith and love. 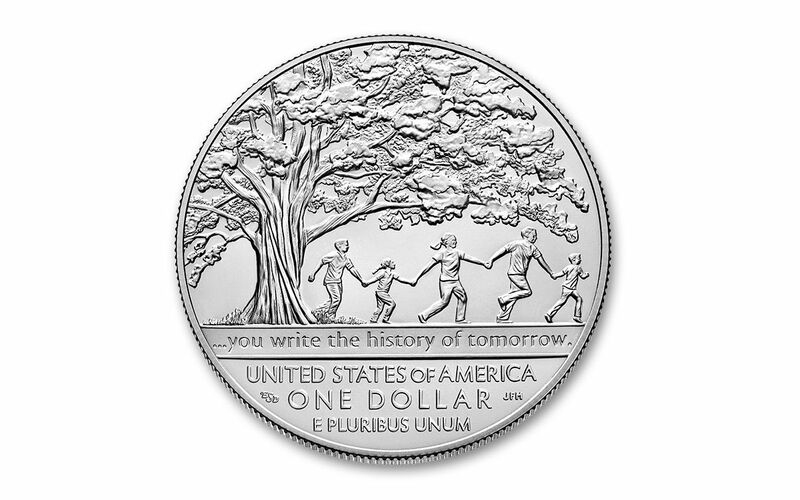 A Vision of Hope in 90% Pure Silver! The United States Mint is celebrating the momentous 100th anniversary of the founding of Boys Town with the release of this 2017 Boys Town Commemorative Proof. 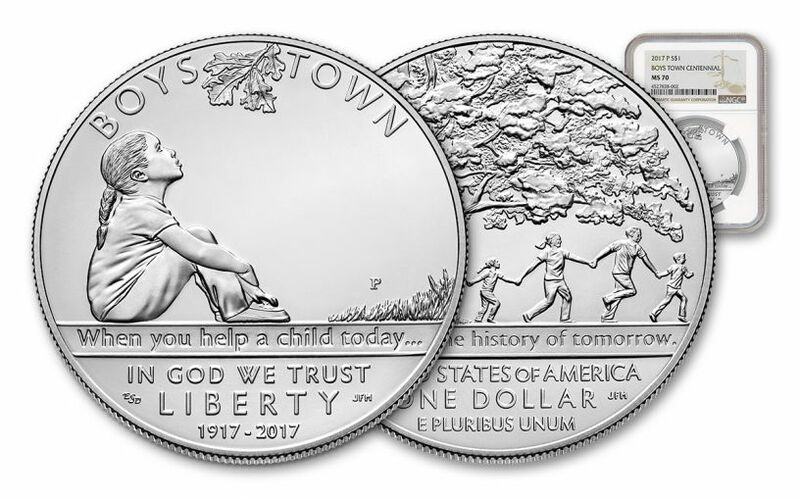 Produced at the Philadelphia Mint, each legal-tender US one dollar proof features the artful representation of the transformative power of Boys Town's work. On one side, a girl looks up at a single, weathered leaf. The inscription "When you help a child today . . ." begins Father Flanagan's famous quote. The literal flipside of this lonely scene is one filled with hope, depicted as a joyous family under a strong, vibrant oak tree, accompanied by the quote's completion, ". . . you write the history of tomorrow." 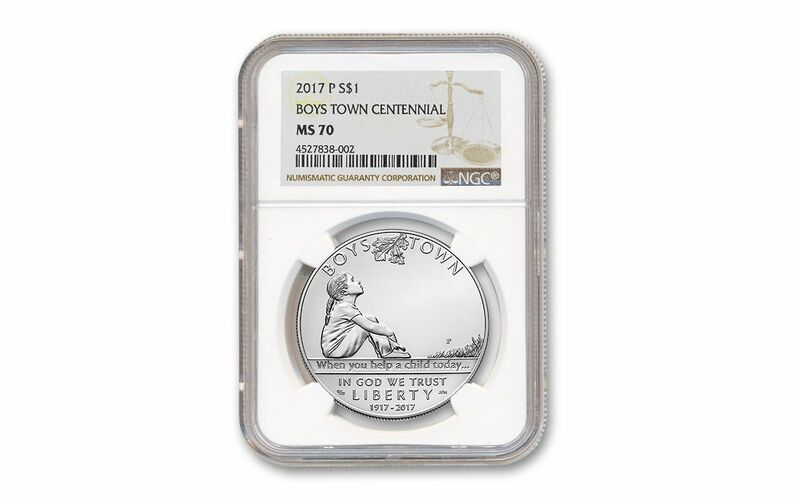 This symbolic commemorative coin will arrive to you in flawless Mint State-70 (MS70) condition, certified by Numismatic Guaranty Corporation (NGC). This distinction means that your perfectly-graded coin will have ZERO imperfections -- showing all features and fields exactly as the engraver and mint intended! A portion of the original proceeds for each commemorative goes directly to support the continuing efforts of Boys Town. Don't wait to bring home this stunning celebration of the past and hopeful vision of the future. 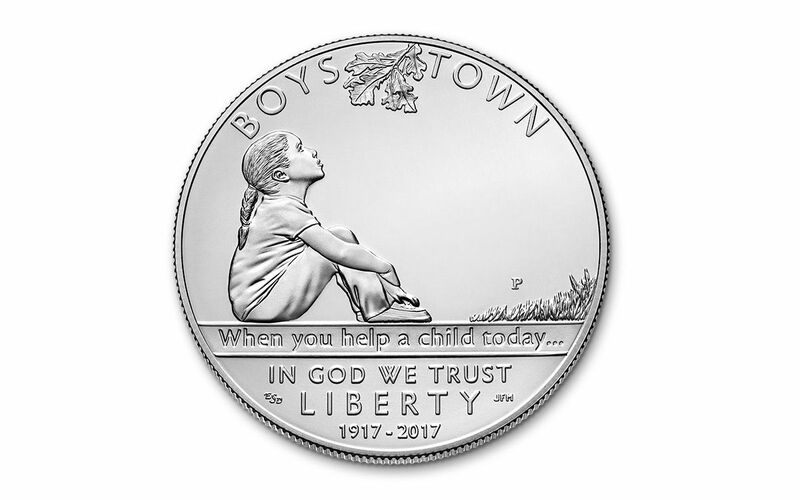 Order your 2017 Boys Town Commemorative Coin today!